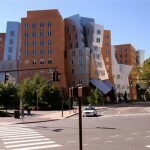 A couple of weeks ago when I was browsing through Google Earth, I came across some photographs of the MIT Ray and Maria Stata Center, more commonly known as simply the Stata Center. This building has always amazed me ever since the first time I stumbled upon it. It is quite an impressive sight. 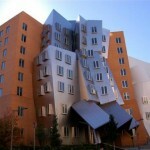 Oddly enough, I live within walking distance of this building. 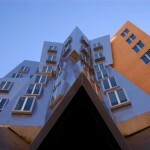 I didn’t realize until I read the Wikipedia entry on the building that several notable people have their offices in the Stata Center, including Noam Chomsky, Tim Berners-Lee and Richard Stallman. The funniest thing for me about the architecture of the building is that it has always given me a very visceral reminder of Ayn Rand’s novel The Fountainhead. Every time I see the building I think that it looks like something Howard Roark would have built. 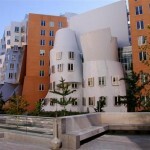 On October 31, 2007, MIT sued architect Frank Gehry and the construction company, Skanska USA Building Inc., for “providing deficient design services and drawings” which caused leaks to spring, masonry to crack, mold to grow, drainage to back up, and falling ice and debris to block emergency exits. A Skanska spokesperson said that prior to construction Gehry ignored warnings from Skanska and a consulting company regarding flaws in his design of the amphitheater, and rejected a formal request from Skanska to modify the design. This is most certainly not something that Roark would have done. If not this though, what would one of Roark’s buildings actually have looked like? It is apparently a common speculation that Rand based Roark’s architecture on that of Frank Lloyd Wright. Although she has specifically denied this, it seems to me to be a very close match based upon her descriptions of Roark’s architecture.